Our mission: is to reduce the effects on the environment, by building sustainable developments for the future. Linton DMC seeks to find improvements through better processes, to provide superior quality and design that is affordable and accessible to all. By embracing innovation and modern methods of construction, Linton DMC is proud to construct Rhodipor Ecobuild, Insulated Concrete Formwork ICF. Linton DMC – building quality for a sustainable future. 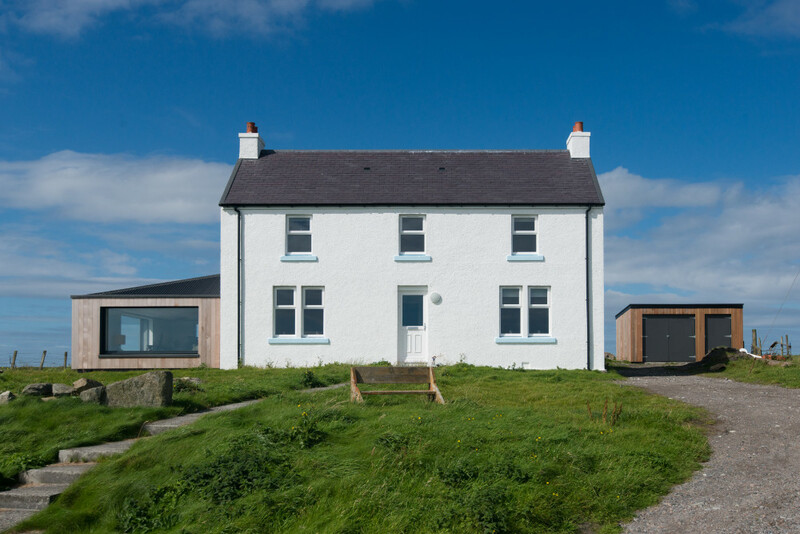 Why Choose Rhodipor Ecobuild ICF? Rhodipor Ecobuild ICF is a modern type of construction, available across both the UK and the rest of the world. Quality, environmental performance, customer satisfaction and sustainability, have seen the number of buildings created with Rhodipor Ecobuild increase year after year. Flexible in design Rhodipor Ecobuild ICF is capable of building to the most advanced self-build techniques and methods, enabling you to build a sustainable home or base of operations to suit you. A building system that is simple to easy, the structure connects together just like lego. As one of the most trusted eco-friendly building systems in the country, Linton DMC is proud to offer Rhodipor Ecobuild ICF to our customers. 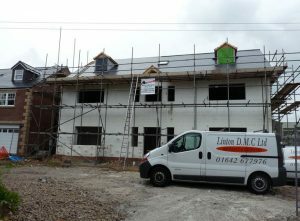 Creative and innovative design opportunities, self-build your own property. Reduction of energy costs; warm in the winter, cool in the summer. Superior structural strength and quality. High mass walls allow for less sound transmission. Less labour intensive with minimal equipment, construction is simple and efficient. Healthier way of living, a house that is beneficial to the environment. Environmentally Friendly, non-toxic less environmental pollution. To find out more information on What Rhodipor Ecobuild is, click here. Why choose Rhodipor Ecobuild ICF to build your home? 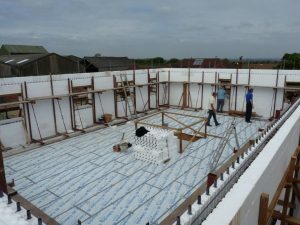 Rhodipor Ecobuild ICF properties are one of the most advanced yet simple ways to self-build your own property. Healthy Living Environment – designed as a block structure there is minimal air leakage. It has been found that occupants suffer less of allergies and chest complaints that are caused by dust and pollen within their home. Sound Insulation – thickness and density of the concrete cores, provides you with excellent sound insulation. Flood Damage Prevention – homes built with Rhodipor Ecobuild ICF are unaffected by water. An Ecobuild ICF property can withstand the pressure of water and any property damage is minimised. Properties that have been affected by a flood, the water can be pumped out and air dried to leave the structural integrity intact. High Fire Resistance – Rhodipor Ecobuild ICF material provides fire protection higher than normal requirements. This is due to the manufacturer containing a fire retardant substance, which means this product may help prevent fires from starting or limit their spread. High Storm, Wind & Earthquake Resistance – flexibility with the Rhodipor Ecobuild ICF design enables the concrete structure to be built to relevant codes for earthquake zones, adding an increased protection from heavy storms and high winds. Rodent and Rot Prevention – during manufacture a rodent deterrent additive is added, homes are unaffected by vermin. Additionally, the structure does not bio-degrade or rot, however, is still recyclable. Latest in design innovation, the ability to build almost any type of property, with quality to withstand many environmental factors and cost savings, it’s never been simpler to create the property you’ve always imagined.